BACK TO SQUARE ONE .....IT'S MORE THAN A KIDS' GAME ! Board game perhaps is as old as civilizations itself . 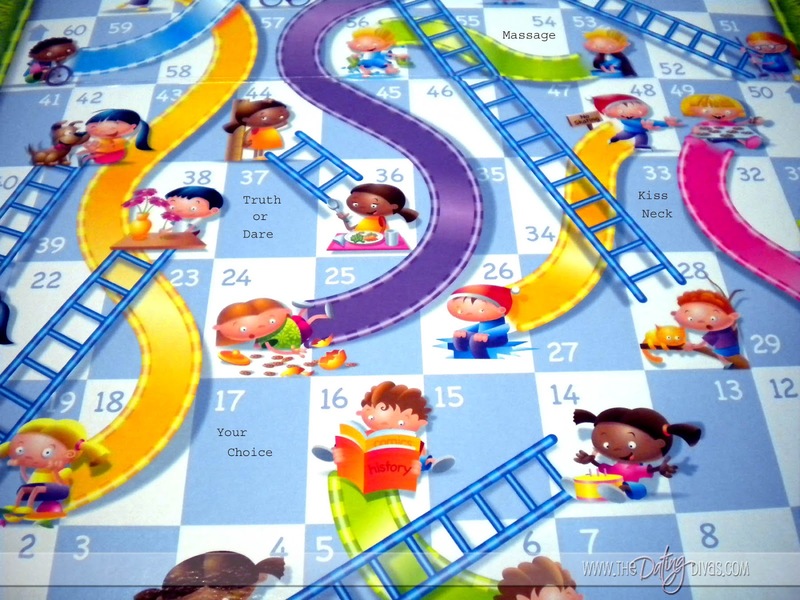 Snakes and Ladders ( Chutes and Ladders) is widely played around the world , could be the most popular board game ever played . As everyone knows , it can be played and enjoyed by anyone , at any age, even illiterate grand parents with their 'computer savvy' great grand children . 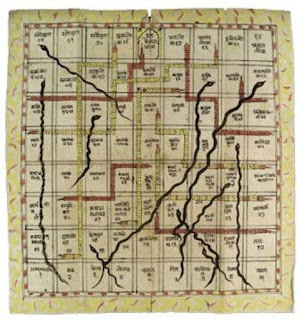 Its simplicity - two or more players with a dice and a board without any skills - might have made this game a favourite among people all the time but the intentions of the Snakes and Ladders when invented in ancient India is not that simple , it was noble ......something we all should cherish to know and practice in daily life to this day! 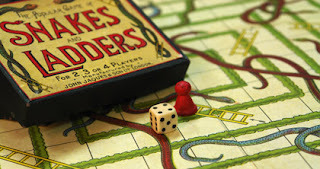 This could be the reason why Snake and Ladders became one of the the oldest live board games among all others' of ancient civilisations - Egyptian, Mayan, Indian, Chinese, Persian......which is played to this day. It is invented in India as early as in 2nd century BC. 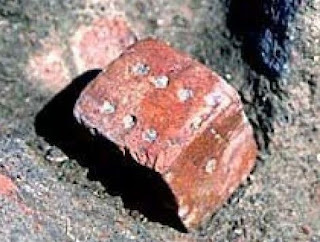 A dice as in the photo below is excavated from the Harappan site .There is not a single inventor of the game but was formulated by a group of Indian ( Hindu) spiritual teachers . The game was invented for the people to be aware of good and bad in life and had in depth roots in morality lessons .Early names of the game in Sanskrit is Moksha Patamu which can be translated to Ladder to Salvation . The life is a journey completed by virtues(ladders) and vices(snakes) . The essence of the game is perform the righteous good deeds and one will attain nirvana (salvation) scoring 100! It is equally interesting and amazing to note how the original game was designed to impart quality in every one's life , 4000 years back ! 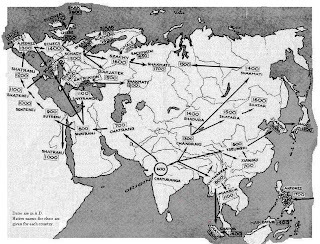 That's was a time when the world was in bronze age , of course USA or AUS is not even discovered.The game as we see now is formulated by a Hindu saint poet named Gyandev in the 13th century and since then many versions have taken place in India and elsewhere. Each ladder represented good values in life like Faith(12), Reliability(51),Generosity(57), Knowledge(76)....while snakes represent Lust(99), Pride(95),Greed(92),Rage (84),Murder(73),Debt (69), Drunkenness(62), Lying (58), Theft (52), Vulgarity(49),Vanity(44), Disobedience(41)....Most of you , I am sure you will agree with me , to note that these virtues and vices are very much valid to this day , wherever you are on the globe. But what baffles me is the fact they had graded the virtues and vices giving them the relevant numbers in the game (life) which they thought ( we may differ, still)will have a proportional rise and fall in one's life .The number of ladders was much less than the number of snakes- a reminder that a path of good is much more difficult to tread than a path of sins. In the lighter side of it , as nobody is easily attracted to listening to good teachings and preachings, religious or otherwise , which is true to this day , they designed a simple , interesting game which can be played by anyone , thus giving the right message to people . But hats off to them that they masterminded it 4000 years back ! India gave birth to Chess as well .Chaturanga as known in India was a game modelled on military warfare techniques used by kings those days in 6th century AD the pieces were called elephants , chariots, horses and foot soldiers.The game was learned by Persians later which was named as Shatranj, exported to Arab world and from there to Europe and rest of the world . 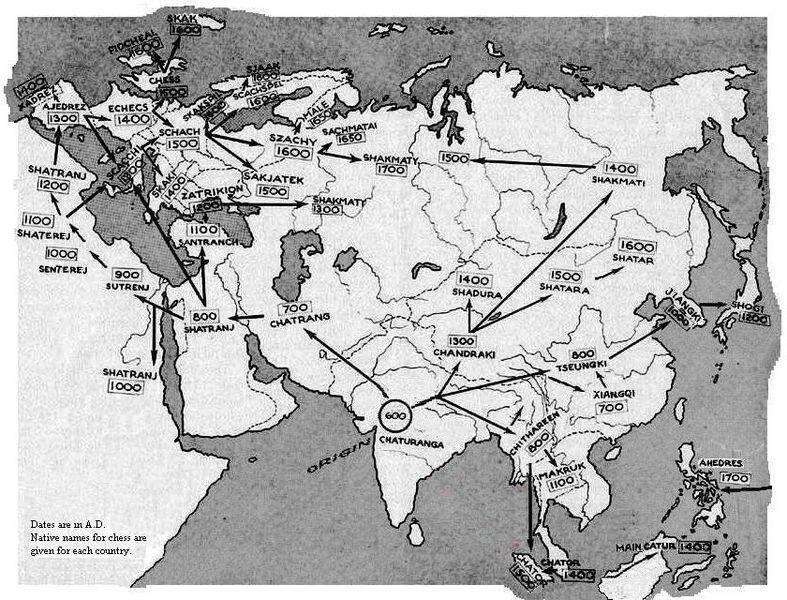 Other board games India contributed to the rest of the world are Carom and Ludo. If so many grand masters are there in India and Russia , it is not by accident but by virtue of the past. Come this November , we will see whether the Norwegian wonder kid Magnus Carlsen can bulldoze reigning world champ Vishwanathan Anand. After the British came to India , the game of Moksha Patamu went to England in 1892 and surfaced as Snakes and Ladders . The morality of the game might have appealed to the Victorian England and they re termed some of the virtues.While Penitence, Thrift and Industry elevated a player up the ladder to squares labelled Grace, Fulfilment and Success, a player goes down by the snakes of Indolence, Indulgence and Disobedience to squares named as Poverty , Illness and Disgrace!! It is widely believed that the expression of the English term 'Back to square one ' meaning you can be sent back to square one ,if you land in the wrong snake ,thus started being used in England!! 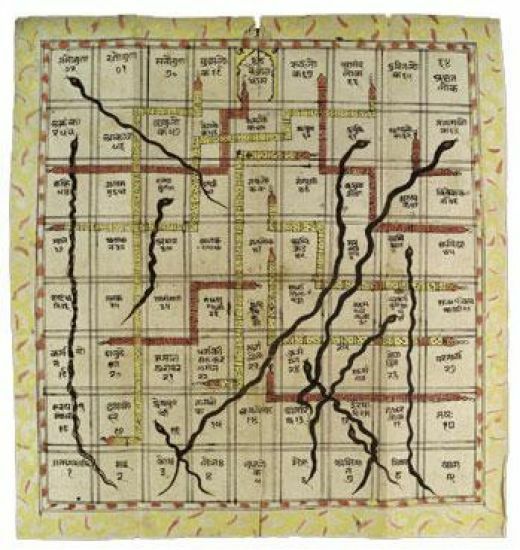 Jain version of Snakes and Ladders is still exhibited in Victoria and Albert Museum ,London. 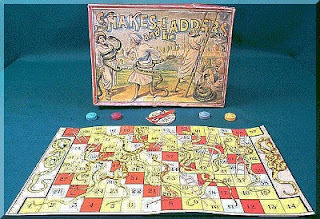 Snakes and Ladders went to USA as late as in 1943 . 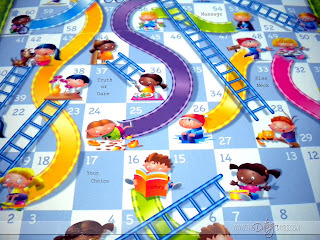 Game pioneer Milton Bradley made it as Chutes and Ladders game in 1952 with a spinner instead of a die. The morals were simplified in the forms of Deeds and Consequences .Of course good deeds are ladders and bad deeds are chutes(snakes). Illustrations of the game were simplified to what is required in one's daily life in the modern age than aiming to attain salvation (moksha). Examples were pictured in the game such as if a child drinks milk (ladder), he or she becomes more healthy ; if the child reads (ladder) he or she becomes a scholar.....In the same way there are pictures of children enjoying in mischievous or foolish behaviour and the moves on the bottom show the child suffer consequences . Milton Bradley co was taken over by Hasbro Inc in 1984. In 1986 they produced the first version of VCR of the game Chutes and Ladders. Now as we all know it can be played in a computer or even in your cell telephone! It could be interesting to know that some management schools teach the executives some techniques of Asset Management or Financial Management on the basis of pattern of the game and use it as a teaching tool. Snakes and Ladders is a game in which chance(the dice) and uncertainty (the lay of the board) impact on the achievement of the goal. The game played in the school allows the executives to create their own board identifying what 'ladders' they need to put in place to implement Management in their organization while identifying the 'snakes' that can impact a successful operation! Since the original concept of the game dates back to ancient India. Modern India has so far shied away on the subject of copy right or patent and many different companies around the world are able to market the game of Moksha Patamu in many names and forms like in cases of other hundreds of ancient Indian products which are being used the world over without a credit to the original mother country!! Surprising and equally sad fact is that not only India lags behind to take fast appropriate action related to patents and intellectual property rights but also that most of the Indians are ignorant of origin of those products ! !